Today is opening day for baseball in the US and Canada. 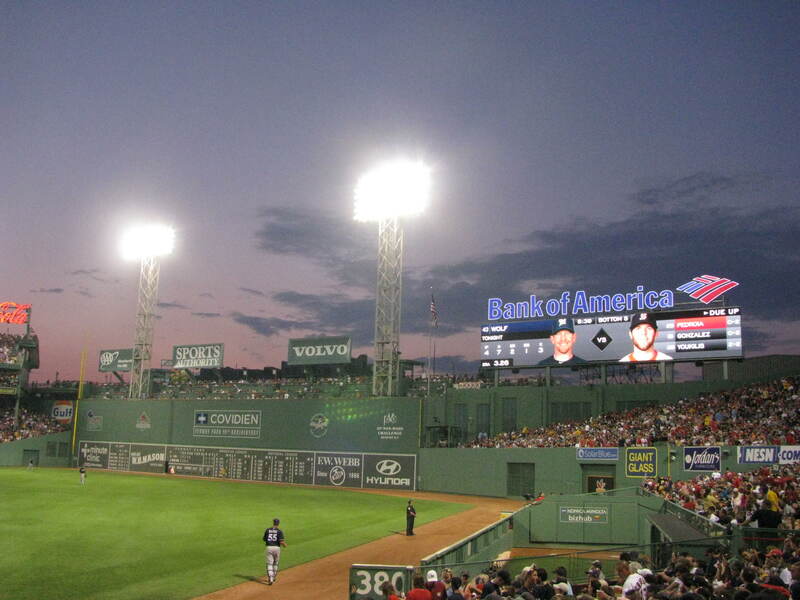 I took this photo last year during a game at Fenway Park in Boston, Massachusetts. I won’t be able to watch too many games this season in London, but I’m sure my friends back home will keep me posted. This entry was posted in Boston, Travel, Travel Photos and tagged Baseball, Boston, Fenway Park, Massachusetts, Opening Day, Photography, Photos, Red Sox, Sports, Travel Photos. Bookmark the permalink. An home opener on Friday the 13th…I’m thinking there is a movie in this 🙂 I hope you can go! I hope you get good updates from your friends! Fortunately several of my friends are sports nuts! Too bad MLB has abandoned tradition in its continual search for the financial greenback. So were the days when MLB recognized the Reds as the official start of the season. Nonetheless, there is no place like Cincinnati on Opening Day. Sounds like I should add opening day in Cincinnati to my bucket list. Thanks for the tip! Good luck this season. Are you going to any games this year? Oh by all means take in Opening Day in Cincy … cheesy parade and all. Always lots of excitement. I was considered going down to find a single ticket, but given the game time (4 pm), I came to my senses. Meanwhile, I’ll make to the GABP at various times. Good luck to your Red Sox too! I do love a good cheesy parade! I hope you get to see many games. I hope the Red Sox start off stronger this year than they did last year. LOL…What team do you follow? You’ve lived in Boston, Southern California, and NYC. At this point I just follow baseball. I really was a Yankee fan back in the Mattingly/Winfield and then O’Neill/Martinez days but they are all too corporate now (and I don’t worship Derek so I am disqualified anyway). Stopped rooting for the Sox a long time ago. The Mets owners put me off of them so, I just go to games because I love the sport and root for a tight well played game. In my mom’s home town of Ft. Myers they just opened a replica of Fenway Park where the Red Sox come for Spring training. Just saw it a few weeks ago… it’s an amazing stadium. That’s pretty cool. I do enjoy going to Fenway Park in Boston. Is it just as small? I do hope to get out to some games this year. I have no delusions that the Royals are going to be competitive, I just want to see a game on a nice Spring evening before it gets too hot. But there is something so special about going to the ballpark, even if your team isn’t winning. On many occasions, the Red Sox lost while I was at the game. I started to think I was a curse. So the fans might be glad that I am no longer in the city. However, I didn’t go to that many games so they might have to blame someone else 🙂 I hope you get your wish Carl! I did start following the Red Sox while I lived in Boston. It was nearly impossible not to be swept away by the Red Sox Nation. Enjoy seeing the Yankees! That should be fun! For Opening Day in Cincy, there are several photo galleries here. I’ll miss it, but good thing England is crazy about football and tennis. Those are my favorite sports.